How humiliating! Here we have all the personally chosen disciples of Jesus, all too proud to wash each others feet, now having their feet washed by their teacher and soon to be Savior. How would you feel if Jesus did something for you that you were too proud to do for someone else? The disciples were too proud to do a necessary job, so Jesus does it for them. No wonder Peter objects (vs. 8). I would too. I’d be embarrassed and ashamed to let Jesus do something I was too proud to do. I’m sure we’ve all had experiences where a leader we admired shamed us by doing a job we showed ourselves too proud to do. I witnessed a senior pastor washing dishes after a church fellowship while the men on the church board left early. I watched a wealthy business owner wash dirty windows because his too-proud employees didn’t want to be seen doing such a menial task. I know about a bi-vocational pastor who was vacuuming the fellowship hall while retired members of the church watched from their chairs. Maybe it never occurred to them to help. Or maybe they were too embarrassed to do the job they should have volunteered to do in the first place. Jesus reminds us it is never too late to serve. Jesus got up in the middle of the meal to remind us it is never too late to do what is right. I don’t think Jesus wanted to shame His disciples, but many times we bring that shame upon ourselves. I know I have. I’ve also learned that humility will eliminate shame if I will act in the manner of Christ. I also know I have the supreme example of servanthood from the one Person I should be serving with all my life. If becoming a man and dying for my sins was not beneath the dignity of God my Savior, then there is nothing in God’s kingdom that is beneath the dignity of me, His servant. It is a lesson I’m learning late in life, but I’m glad to know I’m learning it. You’re welcome, Pam. Have a marvelous day in the Lord. great blog… press on! reminds of the advice to sit at the end of the table instead of attempting to steal the blessing by sitting at the front of the table. recently happened to me at work. i held back and allowed my colleague to position himself for the blessing… the boss asked me to take the lead. i was blessed. 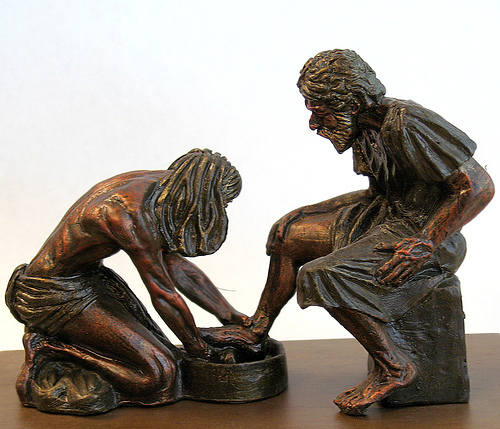 Thank you for your reflections on the foot washing. The dirt on their feet was all more than just dust, since animals were not toilet trained…. From where is the picture you posted? I would like to obtain permission to use it in a course I am creating on the Gospel according to John the Pastor. Thanks for your reply and insights. I don’t know where I got the picture, other that I Googled it, saw it, liked it and used it. Sorry I can’t be more help.